Barcelona, Barcelona. 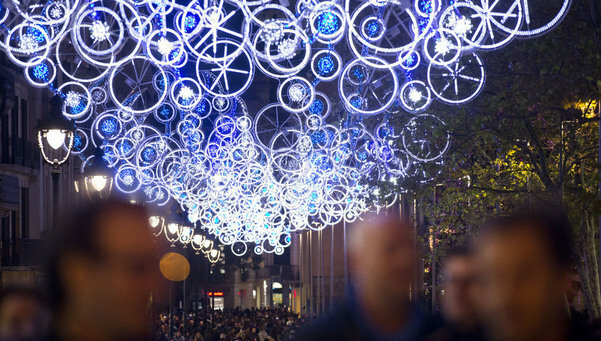 They say New York is the city that never sleeps, but with the Christmas lights hanging out in the streets and Passeig de Gracia looking like a fairy tale, our dear Barcelona appears to be the place to be at this time of the year. Moreover, the sun doesn’t seem to be shy at all even if the temperatures have dropped. But would it be Christmas without a scarf around our neck anyway? The city has done more than just put up decorations; it has also thought about the international students who will be here on December 24 and organised church services in English so that they can experience the “Christmas holiday spirit”. However, December also brings the exam period for our Master and MBA students; but that doesn’t mean the fun should be completely over. How about some time off studying for some challenging equilibrium teamwork exercises? The ice ring is open in Plaza Cataluña and despite the potential falls and bruises, it is has been a great meeting point for EADA students lately. For the dedicated students, libraries might become a sort of second residence. There are several in the Eixample area: Biblioteca Sofia Barat (closest to EADA); Biblioteca Esquerra de l’Eixample – Agustí Centelles; Biblioteca Joan Miró; Biblioteca Sant Antoni-Joan Oliver; Biblioteca Sagrada Família and many more, open from 9 a.m. until 9 p.m. (closed between 2:00 p.m. and 4 p.m., because, not to sound cliché, but we all need to eat. Or nap). (More information on the Barcelona City Hall website). I wish you good luck for the exams and a merry Christmas to those who are flying home as well as those who are sticking around.